Let’s use milk as an example. Suppose milk was $1 per gallon. Many would say that a dollar is worth one gallon of milk. Or, alternatively, a dollar’s purchasing power is one gallon of milk. Suppose that later, the price of milk goes up to $2. Then, people say that the dollar’s purchasing power falls by 50 percent, to half a gallon of milk. Regardless of what you call it, everyone would agree that the dollar buys less than it did. Related; Artificial Intelligence Replace The Military? Of course, the retail price of milk is not directly connected to the cost of producing it. If you doubt this, then maybe you will go out and buy a new BMW 750 and then tell your boss that now your cost of living is higher, and therefore your wage must go up! In all seriousness, if milk producers could charge more, then they would already be charging more. A rising cost of production is the producer’s problem. However, no one can sell at a loss for long. So what happens, in reality, is that producers try to raise their prices. Some consumers are unable to buy milk at a higher price. Others are unwilling. The marginal milk buyer stops buying milk, and may switch to a substitute. The net result is the bankruptcy of some dairy producers, a decline in the quantity of milk purchased by consumers—and much higher prices. In this light, we can see that it is not right to say that the dollar’s purchasing power went down 90 percent. The dollar is paying for just as much as it did, previously. It’s just that the things it buys are increasingly not the things that consumers care about (or even know about). Things like supersized Americans With Disabilities bathrooms for dairy workers, extra motel stays for milk truck drivers do to mandatory stops, forced vitamin D addition, special plastic jugs, taxes, fees, permits, licenses, etc. There are four points we hope that readers will take home from this. First, the term purchasing power suggests something that is untrue. It suggests that the quantity of milk that can be bought for a dollar is intrinsic to the dollar and has nothing to do with what goes into producing milk. Two, whatever the word for forcing milk producers to add more and more useless ingredients may be, that word should not be the same as the one that refers to monetary debasement. Three, people should demand the repeal of laws that force milk producers, and car producers, and home producers, and every other kind of producer, to add ingredients that increase the cost without increasing the value. And four, the Federal Reserve deserves the blame for many ills, but this is not one of them. Add this to the list of reasons why the dollar cannot be measured in consumer prices, why it is not proper to say that a dollar is worth one-tenth of a gallon of milk. If you read gold analysis much, you will come across two ideas. One, inflation so-called (rising consumer prices) is not only running much higher than the official statistic but is about to really start skyrocketing. Two buy gold because gold will hedge it. That is, the price of gold will go up as fast, or faster, than the price of gold. 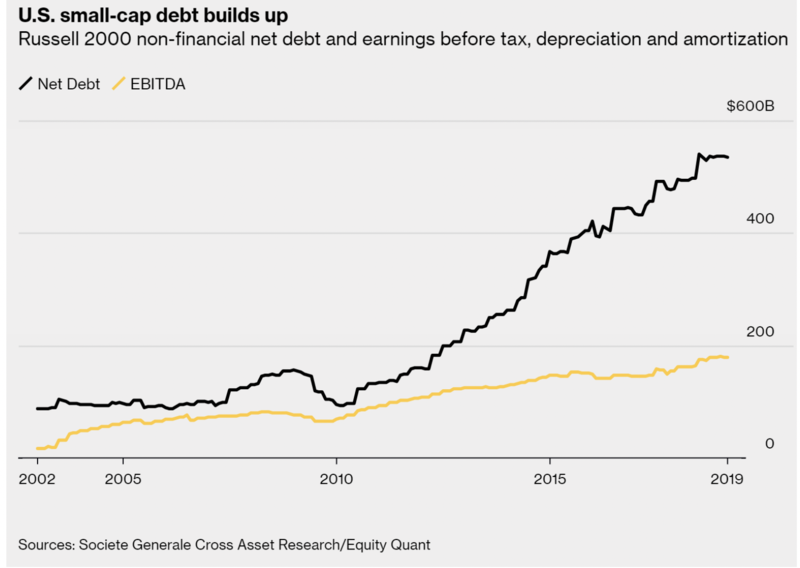 Look at the incredible growth of debt and the modest growth of earnings. From the peak in 2008 until now, earnings grew by 120 percent. But the debt that finances these earnings grew by 264 percent. That is a big increase in leverage. Or, alternatively, we might say that these 2000 companies are consuming their investors’ capital.